Objective: To systematically review outcomes in comatose survivors after cardiac arrest and cardiopulmonary resuscitation (CPR). Methods: The authors analyzed studies (1966 to 2006) that explored predictors of death or unconsciousness after 1 month or unconsciousness or severe disability after 6 months. Results: The authors identified four class I studies, three class II studies, and five class III studies on clinical findings and circumstances. The indicators of poor outcome after CPR are absent pupillary light response or corneal reflexes, and extensor or no motor response to pain after 3 days of observation (level A), and myoclonus status epilepticus (level B). Prognosis cannot be based on circumstances of CPR (level B) or elevated body temperature (level C). The authors identified one class I, one class II, and nine class III studies on electrophysiology. Bilateral absent cortical responses on somatosensory evoked potential studies recorded 3 days after CPR predicted poor outcome (level B). Burst suppression or generalized epileptiform discharges on EEG predicted poor outcomes but with insufficient prognostic accuracy (level C). The authors identified one class I, 11 class III, and three class IV studies on biochemical markers. Serum neuron-specific enolase higher than 33 μg/L predicted poor outcome (level B). Ten class IV studies on brain monitoring and neuroimaging did not provide data to support or refute usefulness in prognostication (level U). Conclusion: Pupillary light response, corneal reflexes, motor responses to pain, myoclonus status epilepticus, serum neuron-specific enolase, and somatosensory evoked potential studies can reliably assist in accurately predicting poor outcome in comatose patients after cardiopulmonary resuscitation for cardiac arrest. Discussions about the level of care—continuing intensive care or withdrawal of life sustaining support—may start as early as the day of admission and are many times motivated by a neurologic consultation. Neurologists make a key contribution in the assessment of comatose patients and the direction of level of care. First, neurologists are expected to provide accurate prognostic information: will the patient awaken, and, if so, in what neurologic state? Second, neurologists are expected to communicate the findings to family members, regrettably, often to announce grave seriousness of the patient’s condition. If the probability of devastating neurologic disability is high, family members or proxy may prefer no further resuscitation, no surgical interventions, or the withdrawal of critical care. When instructed by the patient’s prior written advance directives, others may quickly opt to limit care to comfort measures alone. The assessment of neurologic prognosis has long been based mainly on the algorithms of Levy et al.,3 which derive from a single cohort study and brings about substantial statistical uncertainty. In developing practice parameters, it is important to consider all the available evidence, to assess its validity, and to provide an estimate of the accuracy of independent predictors. This is particularly opportune because new prospective data have been published7–10 since the article by Levy et al. An international group was formed to review the prognostic value of the clinical examination and of ancillary investigations (electrophysiologic, biochemical, and radiologic) for poor outcome in comatose survivors after CPR. We specifically assessed the value of the following seven variables to predict poor outcome: Circumstances surrounding CPR, elevated body temperature, neurologic examination, electrophysiologic studies, biochemical markers, monitoring of brain function, and neuroimaging studies. We excluded studies in which coma was not adequately described, single case reports, papers dealing with selected subgroups of patients, and papers written in a language other than English, German, French, or Italian or when an English translation was not available. Selected articles fulfilled the following inclusion criteria: documented cardiac arrest, age ≥17 years, and we accepted the following definitions of coma: Glasgow Coma Scale score sum score ≤8, “persistent unresponsiveness,” and “not regaining consciousness.” Poor outcome was defined as 1) death or persisting unconsciousness after 1 month or 2) death, persisting unconsciousness, or severe disability requiring full nursing care after 6 months. We chose these outcome measures because the chance of survival without severe motor or cognitive disability is virtually nil in patients who are vegetative ≥1 month or more after CPR or in patients who are severely disabled after ≥6 months. Rating and assessment of studies. Four class I studies,3,7,10,14 three class II studies,15–17 and five class III18–22 studies were reviewed on circumstances surrounding CPR and clinical features. One class I study,7 one class II study,23 and nine class III studies17,19,24–30 were reviewed on electrophysiologic studies. One class I study,7 11 class III studies,22,31–40 and three class IV studies41–43 were reviewed on biochemical markers. Recommendations were graded according to the American Academy of Neurology evidence classification scheme for rating of a prognostic article, established by the Quality Standards Subcommittee (see appendixes 2 and 3). The reviewed studies are summarized in evidence tables. We used opinion papers and expert opinion to formulate suggestions to communicate with family members. Are the circumstances surrounding CPR predictive of outcome? One class I study14 has documented differences between patients with poor and those with good outcomes for anoxia time (time between collapse and initiation of CPR), duration of CPR, cause of the cardiac arrest (cardiac vs noncardiac), and type of cardiac arrhythmia (ventricular fibrillation or tachycardia vs asystole or electro-mechanic dissociation) (appendix E-1). The FPR of these variables was unacceptably high, ranging from 20 to 27% with narrow CIs. Anoxia time, duration of CPR, and cause of cardiac arrest are related to poor outcome after CPR, but none of these variables can discriminate accurately between patients with poor and those with favorable outcomes. Prognosis cannot be based on the circumstances of CPR (recommendation level B). Is hyperthermia predictive of outcome? One class II study15 reported an association between elevated body temperature (measured with tympanic thermometry within the first 48 hours) and associated poor outcome. For each degree Celsius above 37 °C, patients were 2.26 times more likely to die or remain in a vegetative state after 6 months. However, patients with poor outcome cannot be identified with body temperature measurements alone. Elevated body temperature (>37 °C) is associated with poor outcome. However, hyperthermia alone could not discriminate accurately between patients with poor and those with favorable outcomes. Prognosis cannot be based on elevated body temperature alone (recommendation level C). Which features of the neurologic examination of the comatose patient are predictive of outcome? The predictive value of the Glasgow Coma Scale (GCS) score, the motor part of the GCS, brainstem reflexes (pupillary light reflexes, corneal reflexes, and eye movements), and the presence of seizures or myoclonus status epilepticus have been investigated in three class I studies,3,7,10 two class II studies,16,17 and five class III studies18–22 (appendix E-1). Because most patients are intubated in the first few days after CPR, and eye opening to pain may occur early in the course without implying a favorable prognosis, the motor component of the GCS score is more useful and accurate than the GCS sum score.3 False-positive predictions of poor outcome may occur with a GCS motor score <2 (i.e., extensor or absent motor responses) 24 to 48 hours after CPR, but no false predictions occurred after 72 hours3,7,10 (FPR = 0, 95% CI: 0 to 6). Similarly, there were no false predictions of poor outcome for absent pupillary light reflexes 24 to 72 hours after CPR, absent corneal reflexes after 3 days, and absent eye movements (i.e., no spontaneous eye movements and absent oculocephalic reflexes) after 3 days, but the long CIs concerning eye movements reduces their prognostic reliability. (appendix E-1). Overall, at 72 hours, a GCS motor score ≤2 or absence of brainstem reflexes had a 0 FPR (95% CI: 0 to 3). Single seizures and sporadic focal myoclonus do not accurately predict poor outcome.7,19 In contrast, in one class I study7 and one class III study,20 myoclonus status epilepticus (defined as spontaneous, repetitive, unrelenting, generalized multifocal myoclonus involving the face, limbs, and axial musculature in comatose patients) was invariably associated with in-hospital death or poor outcome, even in patients with intact brainstem reflexes or some motor response. Myoclonus status epilepticus may be only present on the day of CPR or may not be noted. This may explain the major discrepancy in reported prevalence.7,19,20 In our meta-analysis, FPR was 0% (95% CI: 0 to 8.8) for poor outcome associated with myoclonus status epilepticus on day 1. In one class IV postmortem study,55 this condition was associated with severe ischemic brain, brainstem, and spinal cord damage. Myoclonus status epilepticus has been reported with patients surviving only with severe disability including persistent vegetative state.7,20,56 Incidental cases have been described with good recovery,57–60 mainly in patients in whom circulatory arrest was secondary to respiratory failure. In some of these cases, accumulation of sedative agents could have been confounders, and in others, myoclonus may not have been generalized, persistent, and merely sporadic. The following clinical findings accurately predict poor outcome (FPR of 0 with narrow CIs); myoclonus status epilepticus within the first 24 hours in patients with primary circulatory arrest, absence of pupillary responses within days 1 to 3 after CPR, absent corneal reflexes within days 1 to 3 after CPR, and absent or extensor motor responses after 3 days. The prognosis is invariably poor in comatose patients with absent pupillary or corneal reflexes, or absent or extensor motor responses 3 days after cardiac arrest (recommendation level A). Patients with myoclonus status epilepticus within the first day after a primary circulatory arrest have a poor prognosis (recommendation level B). Which electrophysiologic studies are helpful in determining outcome? Electrophysiologic tests in coma consist of EEG and evoked/event-related potential (EP) studies. Published EEG series include one class II study23 and four class III studies19,24–26 (appendix E-2). Most studies report intervals from CPR to EEG recording of <3 days, but there is considerable variation. Complete suppression (isoelectric EEG) or burst-suppression patterns containing generalized epileptiform discharges may have predictive ability for outcomes, but these have rarely been examined separately. Generalized suppression to ≤20 μV, burst-suppression pattern with generalized epileptiform activity, or generalized periodic complexes on a flat background are associated with outcomes no better than persistent vegetative state.63,64 The so-called alpha-coma pattern does not invariably herald a poor outcome.17,65,66 Serial or continuous EEGs may appear more accurate and valid than single EEGs, but this remains to be adequately tested.67 The presence of EEG reactivity and variability has been suggested to favorably predict recovery of consciousness, but this has not been independently demonstrated.64,65 In our meta-analyses of studies reporting malignant EEG patterns, the FPR for poor outcome was 3% (95% CI: 0.9% to 11%). Generalized suppression to ≤20 μV, burst-suppression pattern with generalized epileptiform activity, or generalized periodic complexes on a flat background are strongly but not invariably associated with poor outcome. Burst suppression or generalized epileptiform discharges on EEG predicted poor outcomes but with insufficient prognostic accuracy (recommendation level C). Somatosensory evoked potentials (SSEPs) are much less influenced by drugs and metabolic derangements and are therefore more accurate than EEG in prognostication. One class I study7 and seven class III studies17,19,26–30 (appendix E-3) were identified. Bilateral absence of the N20 component of the SSEP with median nerve stimulation had good predictive value for poor outcome with all but one study showing FPRs of 0%. One class I study and all but one class III studies demonstrated FPRs of 0%. Our meta-analyses data from eight studies demonstrated an FPR of 0.7% for poor outcome (95% CI: 0.1 to 3.7) when bilateral absence of N20 response was recorded. Uncertainty remains about the optimal timing of SSEP testing. The N20 responses may disappear on repeat tests after showing initial preservation after cardiac arrest.68 The intervals from CPR to testing of SSEP vary widely among studies (from hours to many days), but all studies were done within 3 days. A few patients have been reported in whom an absent N20 response > 24 h after CPR was regained later, all with a poor outcome.7 Conversely, the presence of the N20 response is not helpful in predicting outcome as reflected in a pooled sensitivity of only 46%; many patients who fail to recover will have preserved N20 responses. Bilateral absence of the N20 component of the SSEP with median nerve stimulation recorded on days 1 to 3 or later after CPR accurately predicts a poor outcome. The assessment of poor prognosis can be guided by the bilateral absence of cortical SSEPs (N2O response) within 1 to 3 days (recommendation level B). Do biochemical markers accurately predict outcome? One class I study,7 four class III studies,22,31–33 and one class IV study41 have investigated the usefulness of increased serum NSE as a marker of poor outcome (appendix E-4). In the class I study,7 60% of 231 patients had NSE >33 μg/L at day 1 to 3 after CPR. All these patients had a poor outcome (FPR of 0, 95% CI: 0 to 3). Most other studies also found an increase in serum NSE at day 3. However, the cutoff points for a 0 FPR value vary greatly (20 to 65 μg/L). An FPR could not be obtained in two studies, and it ranged from 0 to 11% in five class III studies. Serum astroglial S100 has been investigated in one class I study,7 four class III studies,22,31,33,34 and one class IV study.42 The median FPR was 2% (range 0 to 54%) in the four studies that allowed this calculation, and it was 5% in the class I study. Predictions were based on values measured within the first 2 days after cardiac arrest. Therefore, serum S100 remains a poor prognostic indicator. Creatine kinase brain isoenzyme (CKBB) is present in neurons and astrocytes. Six class III studies35–40 investigated the usefulness of CSF CKBB as an indicator of poor outcome. Values used to identify those with poor outcome varied widely. The median FPR was 15% (range 0 to 33%) in six studies allowing the calculations, indicating a poor prognostic ability. Furthermore, the availability of this test result could have influenced the decision to withdraw life support. Neurofilament in CSF was measured in one class IV study43 2 to 3 weeks after resuscitation in a series of 22 patients and yielded an FPR of 10%. Serum NSE, S100, and CSF CKBB have been investigated as a predictor for outcome with studies using variable cutoff points. For serum NSE levels >33 μg/L at days 1 to 3, one class I study demonstrates a 0 FPR with narrow 95% CIs. Serum NSE levels >33 μg/L at days 1 to 3 post-CPR accurately predict poor outcome (recommendation level B). There are inadequate data to support or refute the prognostic value of other serum and CSF biochemical markers in comatose patients after CPR (recommendation level U). Does monitoring of intracranial pressure and brain oxygenation predict outcome? The development of cytotoxic edema leads to brain swelling. Further injury results from increased intracranial pressure (ICP) and reduced cerebral perfusion pressure. ICP >20 mm Hg in comatose patients has been associated with poor outcome in one class IV study.44 Two class IV studies45,46 have suggested prognostic value of brain oxygenation (using oximetric jugular catheters). One class IV study45 suggested the oxygen glucose index predicted recovery of consciousness (appendix E-5). The prognostic usefulness of monitoring of brain oxygenation and ICP is inconclusive. There are inadequate data to support or refute the prognostic value of ICP monitoring (recommendation level U). Are neuroimaging studies indicative of outcome? Brain swelling on CT scanning may occur, but its predictive value for poor outcome is not known. The experience with MRI (DWI and FLAIR) as a tool for prognostication in comatose patients after CPR is limited. There is insufficient evidence to precisely delineate lesions on MRI or CT scanning that would conclusively predict poor outcome. There are inadequate data to support or refute whether neuroimaging is indicative of poor outcome (recommendation level U). After CPR, patients are at risk of ischemic damage to multiple organs (postresuscitation injury). Acute renal failure, liver failure, and shock may confound a clinical neurologic examination. Patients may be in cardiogenic shock requiring inotropic agents, may have major metabolic derangements such as a severe metabolic acidosis and other significant organ failure as a result of resuscitation for cardiac standstill. Patients may have received sedatives or neuromuscular blocking agents or induced hypothermia therapy. These therapies and other evidence of organ failure may render prognostic indicators uncertain. However, studies in comatose patients have not systematically addressed the role of these confounders in neurologic assessment. Timely availability of laboratory tests. SSEPs remain the most valuable laboratory test. The technical procedure and validity of SSEPs can be found in a textbook.71 The potentials (N20) of interest require documentation at the brachial plexus level and at the cervical cord to be reliably absent. Interpretation of neurologic examination and electrophysiologic tests requires substantial expertise. Timely availability of SSEP recording and interpretation may differ from hospital to hospital. The measurement of NSE is not an automated test and therefore time-consuming, not readily available, and not standardized. However, one study22 from Germany claimed serum NSE test results could be available within 24 hours. In addition, NSE is present in platelets, and, therefore, hemolysis increases the serum values. MRI or CT scanning in critically ill patients requires displacement out of a controlled supervised environment. In one study,52 17 of 27 (63%) patients could not be safely transported to the radiology suite to undergo MRI. Communication with family and further decision making. The complexity of evaluation and various options of decision making require neurologic professional expertise. The usefulness of the most important prognostic variables in comatose patients after cardiac arrest is summarized in the figure. Figure. Decision algorithm for use in prognostication of comatose survivors after cardiopulmonary resuscitation. The numbers in the triangles are percentages. The numbers in parentheses are exact 95% CIs. Major confounders could include the use or prior use of sedatives or neuromuscular blocking agents, induced hypothermia therapy, presence of organ failure (e.g., acute renal or liver failure) or shock (e.g., cardiogenic shock requiring inotropes). Studies in comatose patients after CPR have not systematically addressed the impact of these factors on the reliability of clinical neurologic examination and tests. Therefore, these confounding factors potentially could diminish the prognostic accuracy of this algorithm. *These test results may not be available on a timely basis. Serum NSE testing may not be sufficiently standardized. When a poor outcome is anticipated, the need for life supportive care (mechanical ventilation, use of vasopressors or inotropic agents to hemodynamically stabilize the patient) must be discussed. Fully informed and more certain, the family or proxy is allowed to rethink resuscitation orders or even to adjust the level of care to comfort measures only. However, these decisions should be made after best interpretation of advance directives or the previously voiced wishes of the patient. 1. Current indicators of poor prognosis in comatose survivors are derived from patients not treated with induced moderate hypothermia. If this treatment becomes standard care, these indicators may need revision. Studies investigating new therapies should specifically record these indicators and correlate them with standard outcome rating scales. 2. The feasibility, costs, and predictive value of MRI (particularly DWI sequences) in determining outcome in patients without certain clinical, electrophysiologic, or biochemical indicators of poor outcome should be further studied. 3. Future studies on outcome are needed. Comprehensive neurologic examination data are still needed. All studies on prognostication are susceptible to “self-fulfilling prophecy.” This is a situation in which a physician’s negative expectation or overreliance on laboratory tests affects management decisions and thus outcome. Therefore, it is paramount that studies adhere strictly to independent assessment of prognostic indicators and outcomes. It is important to describe causes of death (e.g., cardiac arrhythmias, ventricular rupture, brain death due to brain swelling) and the role of withdrawal of support in patients who died. Long-term outcome (1 year) of survivors is needed with detailed assessment of disability. 4. Further investigation of combined use of middle and late components of the auditory evoked responses may help to identify those with poor outcomes in those comatose patients in whom the N20 response on SSEPs is maintained. This statement is provided as an educational service of the American Academy of Neurology. It is based on an assessment of current scientific and clinical information. It is not intended to include all possible proper methods of care for a particular neurologic problem or all legitimate criteria for choosing to use a specific procedure, nor is it intended to exclude any reasonable alternative methodologies. The AAN recognizes that specific patient care decisions are the prerogative of the patient and physician caring for the patient, based on all the circumstances involved. The authors thank Raquel J.S. Nelson and Terry L. Seidel-Duffy for secretarial assistance. Quality Standards Subcommittee Members: Gary Gronseth, MD (Co-Chair); Jacqueline French, MD (Co-Chair); Charles E. Argoff, MD; Stephen Ashwal, MD (ex-officio); Christopher Bever, Jr., MD; John D. England, MD; Gary Franklin, MD, MPH (ex-officio); Gary H. Friday, MD; Larry B. Goldstein, MD; Deborah Hirtz, MD (ex-officio); Robert G. Holloway, MD, MPH; Donald J. Iverson, MD; Leslie Morrison, MD; Clifford J. Schostal, MD; David J. Thurman, MD; Samuel Wiebe, MD (facilitator); and William J. Weiner, MD. Class I: Evidence provided by a prospective study of a broad spectrum of persons who may be at risk for developing the outcome (e.g. target disease, work status). The study measures the predictive ability using an independent gold standard for case definition. The predictor is measured in an evaluation that is masked to clinical presentation, and the outcome is measured in an evaluation that is masked to the presence of the predictor. All patients have the predictor and outcome variables measured. Class II: Evidence provided by a prospective study of a narrow spectrum of persons at risk for having the condition, or by a retrospective study of a broad spectrum of persons with the condition compared to a broad spectrum of controls. The study measures the prognostic accuracy of the risk factor using an acceptable independent gold standard for case definition. The risk factor is measured in an evaluation that is masked to the outcome. Class III: Evidence provided by a retrospective study where either the persons with the condition or the controls are of a narrow spectrum. The study measures the predictive ability using an acceptable independent gold standard for case definition. The outcome, if not objective, is determined by someone other than the person who measured the predictor. Class IV: Any design where the predictor is not applied in an independent evaluation OR evidence provided by expert opinion or case series without controls. U = Data inadequate or conflicting; given current knowledge, predictor is unproven. Approved by the Quality Standards Subcommittee on January 28, 2006; by the Practice Committee on April 27, 2006; and by the AAN Board of Directors on May 4, 2006. Received March 3, 2006. Accepted in final form April 26, 2006. Callans DJ. Out-of-hospital cardiac arrest–the solution is shocking. N Engl J Med 2004;351:632–634. Peberdy MA, Kaye W, Ornato JP. Cardiopulmonary resuscitation of adults in the hospital: a report of 14,720 cardiac arrests from the National Registry of Cardiopulmonary Resuscitation. Resuscitation 2003;58:297–308. Levy DE, Caronna JJ, Singer BH, et al. Predicting outcome from hypoxic-ischemic coma. JAMA 1985;253:1420–1426. Longstreth WT Jr, Diehr P, Inui TS. Prediction of awakening after out-of-hospital cardiac arrest. N Engl J Med 1983;308:1378–1382. Longstreth WT Jr, Inui TS, Cobb LA, et al. Neurologic recovery after out-of-hospital cardiac arrest. Ann Intern Med 1983;98:588–592. Gray WA, Capone RJ, Most AS. Unsuccessful emergency medical resuscitation—are continued efforts in the emergency department justified? N Engl J Med 1991;325:1393–1398. Zandbergen EG, Hijdra A, Koelman JHTM, et al. For the PROPAC study group. Prediction of poor outcome within the first three days of postanoxic coma. Neurology 2006;66:62–68. Bernard SA, Gray TW, Buist MD, et al. Treatment of comatose survivors of out-of-hospital cardiac arrest with induced hypothermia. N Engl J Med 2002;346:557–563. Group THACAS. Mild therapeutic hypothermia to improve the neurologic outcome after cardiac arrest. N Engl J Med 2002;346:549–556. Edgren E, Hedstrand U, Kelsey S, et al. Assessment of neurological prognosis in comatose survivors of cardiac arrest. BRCT I Study Group. Lancet 1994;343:1055–1059. Medical aspects of the persistent vegetative state (2). The Multi-Society Task Force on PVS. N Engl J Med 1994;330:1572–1579. Truog RD, Cist AF, Brackett SE, et al. Recommendations for end-of-life care in the intensive care unit: The Ethics Committee of the Society of Critical Care Medicine. Crit Care Med 2001;29:2332–2348. Fallowfield L, Jenkins V. Communicating sad, bad, and difficult news in medicine. Lancet 2004;363:312–319. Rogove HJ, Safar P, Sutton-Tyrrell K, et al. Old age does not negate good cerebral outcome after cardiopulmonary resuscitation: analyses from the brain resuscitation clinical trials. The Brain Resuscitation Clinical Trial I and II Study Groups. Crit Care Med 1995;23:18–25. Zeiner A, Holzer M, Sterz F, et al. Hyperthermia after cardiac arrest is associated with an unfavorable neurologic outcome. Arch Intern Med 2001;161:2007–2012. Madl C, Grimm G, Kramer L, et al. Early prediction of individual outcome after cardiopulmonary resuscitation. Lancet 1993;341:855–858. Chen R, Bolton CF, Young GB. Prediction of outcome in patients with anoxic coma: a clinical and electrophysiologic study. Crit Care Med 1996;24:672–678. Johkura K, Komiyama A, Kuroiwa Y. Vertical conjugate eye deviation in post resuscitation coma. Ann Neurol 2004;56:878–881. Bassetti C, Bomio F, Mathis J, et al. Early prognosis in coma after cardiac arrest: a prospective clinical, electrophysiological, and biochemical study of 60 patients. J Neurol Neurosurg Psychiatry 1996;61:610–615. Wijdicks EF, Parisi JE, Sharbrough FW. Prognostic value of myoclonus status in comatose survivors of cardiac arrest. Ann Neurol 1994;35:239–243. Cheliout-Heraut F, Durand MC, Clair B, et al. [Importance of evoked potentials in the evolutive prognosis of coma during cerebral anoxia in adults]. Neurophysiol Clin 1992;22:269–280. Pfeifer R, Borner A, Figulla H. Outcome after cardiac arrest—predictive values and limitations of the neuroproteins neuron-specific enolase and protein S100 and the Glasgow Coma Scale. Resuscitation 2005;65:49–55. Edgren E, Hedstrand U, Nordin M, et al. Prediction of outcome after cardiac arrest. Crit Care Med 1987;15:820–825. Hockaday JM, Potts F, Epstein E, et al. Electroencephalographic changes in acute cerebral anoxia from cardiac or respiratory arrest. Electroencephalogr Clin Neurophysiol 1965;18:575–586. Lemmi H, Hubbert CH, Faris AA. The electroencephalogram after resuscitation of cardiocirculatory arrest. J Neurol Neurosurg Psychiatry 1973:997–1002. Young GB, Doig GS, Ragazzoni A. Anoxic-ischemic encephalopathy; clinical and electrophysiological associations with outcome. Neurocrit Care 2005;2. Berek K, Lechleitner P, Luef G, et al. Early determination of neurological outcome after prehospital cardiopulmonary resuscitation. Stroke 1995;26:543–549. Logi F, Fischer C, Murri L, et al. The prognostic value of evoked responses from primary somatosensory and auditory cortex in comatose patients. Clin Neurophysiol 2003;114:1615–1627. Madl C, Kramer L, Domanovits H, et al. Improved outcome prediction in unconscious cardiac arrest survivors with sensory evoked potentials compared with clinical assessment. Crit Care Med 2000;28:721–726. Gendo A, Kramer L, Hafner M, et al. Time-dependency of sensory evoked potentials in comatose cardiac arrest survivors. Intensive Care Med 2001;27:1305–1311. Tiainen M, Roine RO, Pettila V, et al. Serum neuron-specific enolase and S-100B protein in cardiac arrest patients treated with hypothermia. Stroke 2003;34:2881–2886. Fogel W, Krieger D, Veith M, et al. Serum neuron-specific enolase as early predictor of outcome after cardiac arrest. Crit Care Med 1997;25:1133–1138. Martens P, Raabe A, Johnsson P. Serum S-100 and neuron-specific enolase for prediction of regaining consciousness after global cerebral ischemia. Stroke 1998;29:2363–2366. Rosen H, Rosengren L, Herlitz J, et al. Increased serum levels of the S-100 protein are associated with hypoxic brain damage after cardiac arrest. Stroke 1998;29:473–477. Longstreth WT Jr, Clayson KJ, Sumi SM. Cerebrospinal fluid and serum creatine kinase BB activity after out-of-hospital cardiac arrest. Neurology 1981;31:455–458. Clemmensen P, Strandgaard S, Rasmussen S, et al. Cerebrospinal fluid creatine kinase isoenzyme BB levels do not predict the clinical outcome in patients unconscious following cardiac resuscitation. Clin Cardiol 1987;10:235–236. Roine RO, Somer H, Kaste M, et al. Neurological outcome after out-of-hospital cardiac arrest. Prediction by cerebrospinal fluid enzyme analysis. Arch Neurol 1989;46:753–756. Rothstein TL, Thomas EM, Sumi SM. Predicting outcome in hypoxic-ischemic coma. A prospective clinical and electrophysiologic study. Electroencephalogr Clin Neurophysiol 1991;79:101–107. Tirschwell DL, Longstreth WT Jr, Rauch-Matthews ME, et al. Cerebrospinal fluid creatine kinase BB isoenzyme activity and neurologic prognosis after cardiac arrest. Neurology 1997;48:352–357. Sherman AL, Tirschwell DL, Micklesen PJ, et al. Somatosensory potentials, CSF creatine kinase BB activity, and awakening after cardiac arrest. Neurology 2000;54:889–894. Dauberschmidt R, Zinsmeyer J, Mrochen H, et al. Changes of neuron-specific enolase concentration in plasma after cardiac arrest and resuscitation. Mol Chem Neuropathol 1991;14:237–245. Bottiger BW, Mobes S, Glatzer R, et al. Astroglial protein S-100 is an early and sensitive marker of hypoxic brain damage and outcome after cardiac arrest in humans. Circulation 2001;103:2694–2698. Rosen H, Karlsson JE, Rosengren L. CSF levels of neurofilament is a valuable predictor of long-term outcome after cardiac arrest. J Neurol Sci 2004;221:19–24. Gueugniaud PY, Garcia-Darennes F, Gaussorgues P, et al. Prognostic significance of early intracranial and cerebral perfusion pressures in post-cardiac arrest anoxic coma. Intensive Care Med 1991;17:392–398. Ducasse JL, Marc-Vergnes JP, Cathala B, et al. Early cerebral prognosis of anoxic encephalopathy using brain energy metabolism. Crit Care Med 1984;12:897–900. Buunk G, van der Hoeven JG, Meinders AE. Prognostic significance of the difference between mixed venous and jugular bulb oxygen saturation in comatose patients resuscitated from a cardiac arrest. Resuscitation 1999;41:257–262. Torbey MT, Selim M, Knorr J, et al. Quantitative analysis of the loss of distinction between gray and white matter in comatose patients after cardiac arrest. Stroke 2000;31:2163–2167. Schaafsma A, de Jong BM, Bams JL, et al. Cerebral perfusion and metabolism in resuscitated patients with severe post-hypoxic encephalopathy. J Neurol Sci 2003;210:23–30. Edgren E, Enblad P, Grenvik A, et al. Cerebral blood flow and metabolism after cardiopulmonary resuscitation. A pathophysiologic and prognostic positron emission tomography pilot study. Resuscitation 2003;57:161–170. Martin GB, Paradis NA, Helpern JA, et al. Nuclear magnetic resonance spectroscopy study of human brain after cardiac resuscitation. Stroke 1991;22:462–468. Arbelaez A, Castillo M, Mukherji SK. Diffusion-weighted MR imaging of global cerebral anoxia. AJNR Am J Neuroradiol 1999;20:999–1007. Wijdicks EF, Campeau NG, Miller GM. MR imaging in comatose survivors of cardiac resuscitation. AJNR Am J Neuroradiol 2001;22:1561–1565. Els T, Kassubek J, Kubalek R, et al. Diffusion-weighted MRI during early global cerebral hypoxia: a predictor for clinical outcome? Acta Neurol Scand 2004;110:361–367. Altman DG, Machin D, Bryant TN, et al. Statistics with confidence, 2nd ed. Boston: Blackwell BMJ, 2000. Young GB, Gilbert JJ, Zochodne DW. The significance of myoclonic status epilepticus in postanoxic coma. Neurology 1990;40:1843–1848. Thomke F, Marx JJ, Sauer O, et al. Observations on comatose survivors of cardiopulmonary resuscitation with generalized myoclonus. BMC Neurol 2005;5:14. Arnoldus EP, Lammers GJ. Postanoxic coma: good recovery despite myoclonus status. Ann Neurol 1995;38:697–698. Harper SJ, Wilkes RG. Posthypoxic myoclonus (the Lance-Adams syndrome) in the intensive care unit. Anaesthesia 1991;46:199–201. Krumholz A, Stern BJ, Weiss HD. Outcome from coma after cardiopulmonary resuscitation: relation to seizures and myoclonus. Neurology 1988;38:401–405. Morris HR, Howard RS, Brown P. Early myoclonic status and outcome after cardiorespiratory arrest. J Neurol Neurosurg Psychiatry 1998;64:267–268. Synek VM. 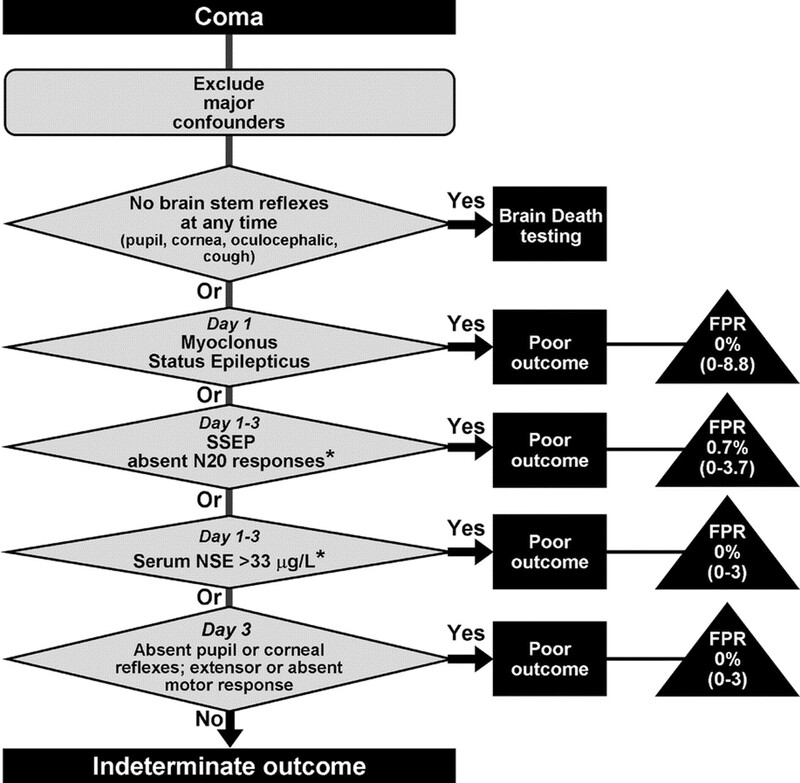 Value of a revised EEG coma scale for prognosis after cerebral anoxia and diffuse head injury. Clin Electroencephalogr 1990;21:25–30. Scollo-Lavizzari G, Bassetti C. Prognostic value of EEG in post-anoxic coma after cardiac arrest. Eur Neurol 1987;26:161–170. Young GB, Doig GS. Continuous EEG monitoring for comatose intensive care patients: epileptiform activity in etiologcially distinct groups. Neurocrit Care 2005;2:5–10. Young GB, Kreeft JH, McLachlan RS, et al. EEG and clinical associations with mortality in comatose patients in a general intensive care unit. J Clin Neurophysiol 1999;16:354–360. Austin EJ, Wilkus RJ, Longstreth WT Jr. Etiology and prognosis of alpha coma. Neurology 1988;38:773–777. Kaplan PW, Genoud D, Ho TW, et al. Etiology, neurologic correlations, and prognosis in alpha coma. Clin Neurophysiol 1999;110:205–213. Young GB. The EEG in coma. J Clin Neurophysiol 2000;17:473–485. Zingler VC, Krumm B, Bertsch T, et al. Early prediction of neurological outcome after cardiopulmonary resuscitation: a multimodal approach combining neurobiochemical and electrophysiological investigations may provide high prognostic certainty in patients after cardiac arrest. Eur Neurol 2003;49:79–84. Mutschler V, Chaumeil CG, Marcoux L, et al. [Auditory P300 in subjects in a post-anoxic coma. Preliminary data]. Neurophysiol Clin 1996;26:158–163. Wang JT, Young GB, Connolly JF. Prognostic value of evoked responses and event-related brain potentials in coma. Can J Neurol Sci 2004;31:438–450. Chiappa KH. Evoked potentials in clinical medicine 3rd ed. New York: Lippincott, Williams & Wilkins, 1997.